Easiest Ever Desserts: 3-Ingredient Cherry-Vanilla Cobbler Minis! / Hey, EEP! 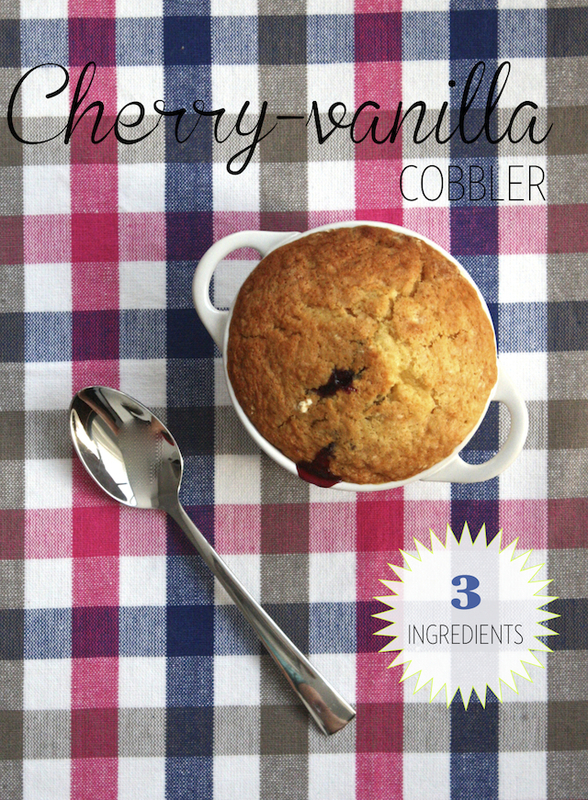 Easiest Ever Desserts: 3-Ingredient Cherry-Vanilla Cobbler Minis! When I first started this blog, I was a college student living in Paris with all the free time in the world to whip up fresh recipes each week. It was heaven! Fast forward six years: My day-to-day has definitely changed and I think the blog has too. I'm a full-time food editor who doesn't always have time to make things from scratch at home! At first I was kind of embarrassed to be posting shortcut recipes, like these cakes or these cookies instead of more extravagant (read: lengthier) desserts. To be totally honest, sometimes I'd even cheat—like I'd post a great tart using my pie crust recipe but I'd use store-bought dough for the photo. But who does that help? I certainly can't be the only person who needs timesavers. I don't always have time to do things right and I'm guessing you probably don't either. So here's what I'm thinking: I'm going to embrace my sorta-homemade recipes from now on and post them proudly, starting with this 3-ingredient cobbler. 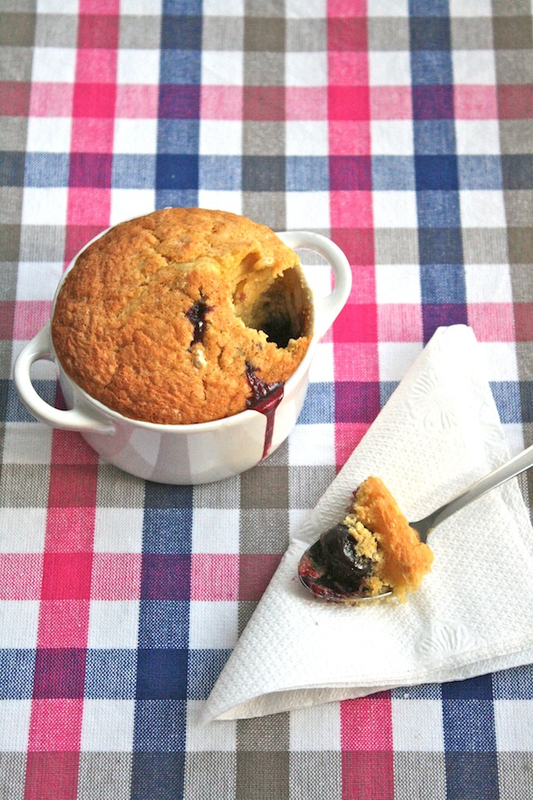 I piled frozen dark sweet cherries into ramekins and topped 'em with a mixture of yellow cake mix and cream soda. Crazy but it works! The result is a sweet-and-tangy dessert that's ready with little effort (and little clean up). Before we skip to the recipe, though: How do you feel about easier, shortcut-y recipes? Is that something you would be interested in? I'd love to know! 2. 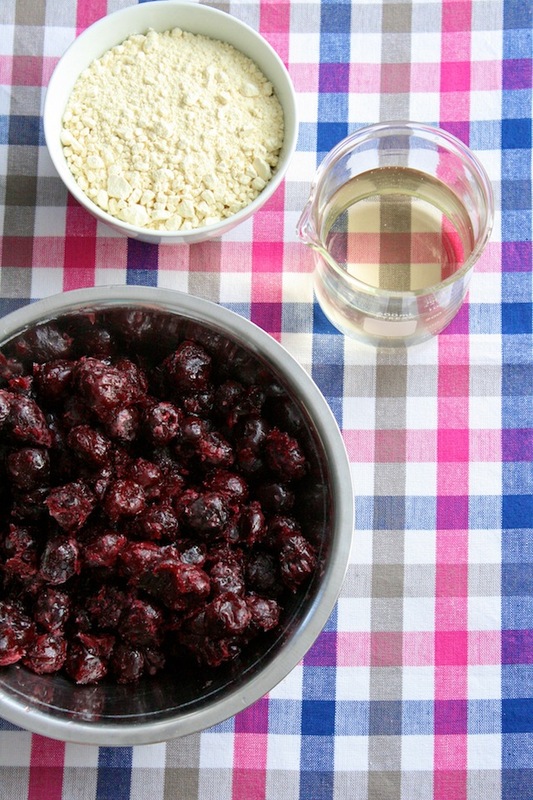 Divide the frozen cherries among 8 to 10 ramekins; no need to thaw or drain. Arrange ramekins on a rimmed baking sheet. 3. Gently whisk the cake mix and soda together in a large bowl until just combined and bubbly. Let sit 5 minutes until the mixture really foams up. 4. Divide batter among the ramekins. Bake until the cherries are bubbling and the topping is puffed and golden, 30 to 40 minutes. Let cool slightly before serving. Want to do a little more? Serve with vanilla ice cream or sprinkle topping with coarse sugar before baking!